It’s the question on every astronomer’s mind this season, both backyard and professional: will Comet C/2012 S1 ISON survive perihelion? Now, new studies released today at the American Astronomical Society’s 45th Annual Division for Planetary Sciences meeting being held this week in Denver suggests that ISON may have the “right stuff” to make it through its close perihelion passage near the Sun. This is good news, as Comet ISON is expected to be the most active and put on its best showing post-perihelion… if it survives. Researchers Matthew Knight of the Lowell Observatory and Research Scientist Jian-Yang Li of the Planetary Science Institute both presented a compelling portrait of the characteristics and unique opportunities presented by the approach of comet ISON to the inner solar system. Jian-Yang Li studied ISON earlier this year using Hubble before it passed behind the Sun from our Earthly vantage point. Li and researchers were able to infer the position and existence of a jet coming from the nucleus of the comet, which most likely marks the position of one of its rotational poles. Could we be in for a “surge” of activity from ISON coming from around November 20th on? Comet ISON as imaged from Aguadilla, Puerto Rico recently on October 6th. (Credit: Efrain Morales Rivera). Li also noted that the reddish color of the coma of ISON suggests an already active comet sublimating water ice grains as they move away from the nucleus. He also noted that time has been allocated to observe ISON using Hubble this week. Next up, researcher Mathew Knight presented some encouraging news for ISON when it comes to surviving perihelion. The findings were a result of numerical simulations carried out by Kevin Walsh and Knight, combined with a historical analysis of previous sun-grazing comets. Both suggest that comet nuclei smaller than 200 metres in diameter, with an average density or lower (for comets, that is) typically do not survive a close passage to the Sun. Both researchers place the size of ISON’s nucleus in the range of 0.5 to 2 kilometres, comfortably above the 0.2 kilometre “shred limit” for its relative perihelion distance. ISON is not a technically Kreutz group sungrazer, though studies of the over 2,000 known Kreutz comets historically observed provide an interesting guideline for what might be in store for ISON. 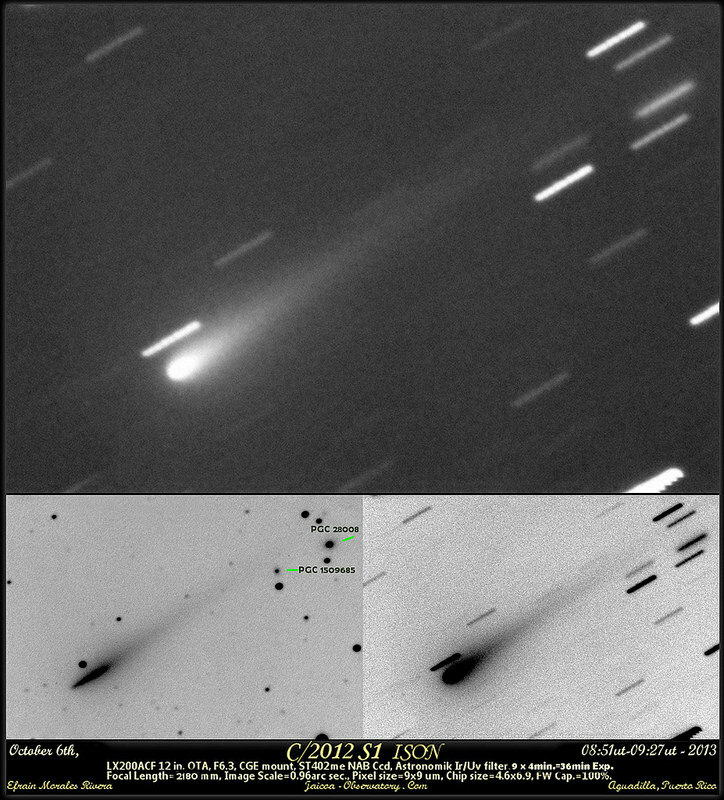 Four Kreutz comets, including C/2011 W3 Lovejoy and Comet C/1887 B1 partially survived perihelion to become “headless wonders,” while five, including Comet C/1965 S1 Ikeya-Seki — which ISON is often compared to — survived perihelion passage to become one of the great comets of the 20th century. ISON will pass inside the Roche limit of the Sun, which is a distance of 2.4 million kilometres (for fluid bodies) and will be subject to temperatures approaching 5,000 degrees Fahrenheit on closest approach. ISON is a first time visitor to the inner solar system. Discovered on September 21st, 2012 by Russian researchers Artyom Novichonok and Vitaly Nevsky participating in the International Scientific Optical Network, ISON will pass less than 1.2 million kilometres above the surface of the Sun on November 28th, 2013. One interesting but little discussed factor highlighted in today’s press release was the retrograde versus prograde rotation of the cometary nucleus. A fast, prograde spin of an elongated nucleus may spell doom for ISON, as tidal forces will rip it apart. A retrograde rotator, however, is very likely to survive the encounter. Thus far, there are no solid indications that ISON is indeed a retrograde rotator, although there are tantalizing hints that beg for further observations. Li notes that it’s tough to infer a bias for comets like ISON to be retrograde over prograde rotators, as we’ve only got five historical comets to go by similar to ISON, and the breakdown is thus about 50/50 for and against. ISON’s possible survival would validate both studies and their methods and give us more refined predictions for future comets. 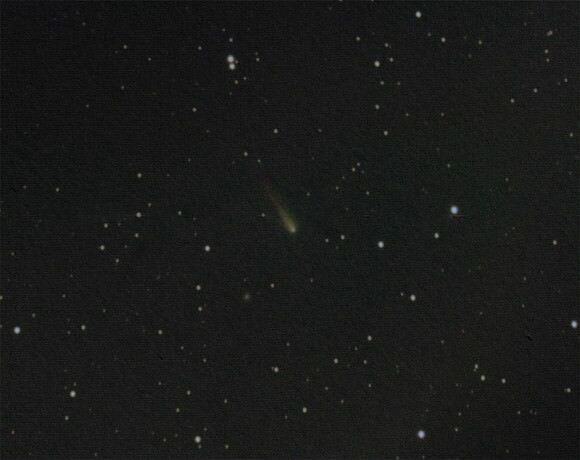 Comet ISON imaged on October 5th from Long Beach, California. (Credit: Thad Szabo @AstroThad). The implications of this analysis is certainly good news for observers. If ISON survives perihelion, we would then have a brilliant dawn Christmas comet unfurling its tail off to the northeast in early December. Of course, these findings are contrary to early cries of its demise, including the paper out of the Institute of Physics that has been circulating touting “The Impending Demise of ISON”. Read Universe Today editor Nancy Atkinson’s excellent synopsis on that, it’s a tale that just won’t seem to die. And we’ve also done our skeptic’s duty of thoroughly debunking the mounting ISON lunacy, including its status as the harbinger for the “end of the world of the week,” as well as its inability to fulfill prophecy. But if we get a surge in ISON next month as researchers suggest, we fully expect the accompanying hype to crest as well. The most recent observations put ISON at about +10th magnitude as it currently crosses the constellation Leo, near Mars and Regulus in the morning sky. We recently did an observing post tracking its plunge to perihelion in late November, and we’ve been diligently hunting for ISON with binoculars every morning pre-dawn. We’re glad to have some positive science to report on for ISON. Things are looking up for a fine show come early December! -Read the PSI press release on JianYang Li’s findings as well as the original paper on ISON’s survival prospects by Matthew Knight.